In my brief time as bishop, I have developed a new appreciation for the staff of our churchwide office. 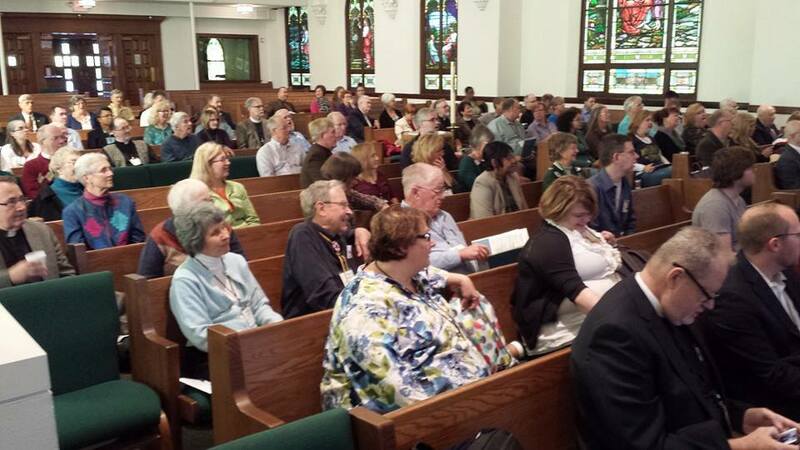 These are people who serve God by advancing the mission of the church, not only in Chicago, but all over the world. Many of these men and women sat in on most, if not all the meetings at the Conference of Bishops held at the Lutheran Center earlier this month. Then several of them flew from Chicago to Perrysburg, Ohio, to play an active role in organizing and facilitating the first Networking for Mission event for the Region VI synods, which include all three Ohio synods, Indiana, Kentucky and Michigan. 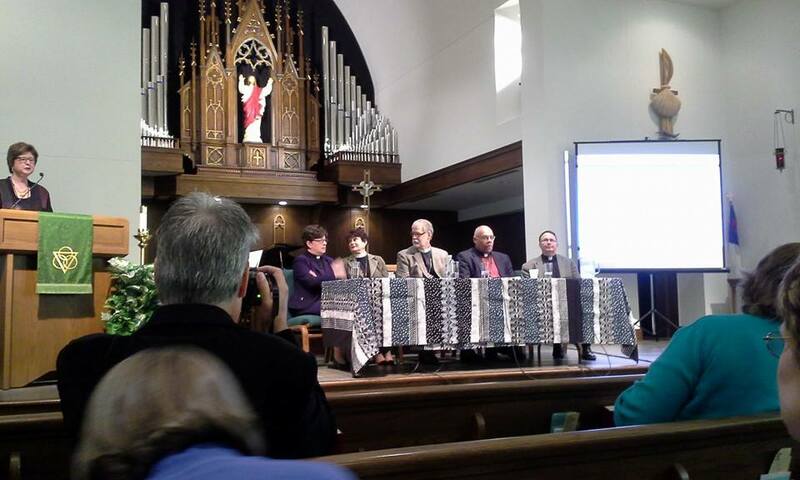 ELCA Networking for Mission Gathering, Zoar Lutheran Church, Perrysburg, Ohio. Final plenary session on Saturday morning. In the Conference of Bishops we have been talking about the need to break down “silos”. This event did that. Churchwide staff from a variety of areas (e.g. global mission, communications, mission interpretation, stewardship, churchwide campaign, world hunger), conversed, worshipped, dined with lay leaders, bishops, some synod staff in a manner that was both informative and energizing for all participants (these days I confess it takes a bit to energize me!). One of the best parts was watching how our lay leaders connected/networked with our gifted churchwide staff (most of whom I have had little interaction in the past). In my 16 plus years in this office I have not experienced an event quite like this one. I echo Bishop Lohrmann’s thoughts. I was not eager to spend another two nights away from home after being gone for eight days. But this event was well worth it. I was more than thrilled that over 20 others from our Northeastern Ohio Synod, both clergy and laypersons, were present to interact with staff and with each other. Their concern for what we do as church together gives me a sense of hope that God will be served and we will continue to work faithfully for the mission of the kingdom. Each bishop was able to gather with his or her synod for about an hour. It was not long enough. I would hope this time spent together inspires us to stay in conversation with each other. One of our little [synod] group in the room was a pastor who confessed that he has struggled for years with whether to remain a part of the ELCA. Coming to this event was a sort of last chance in his discernment about leaving. Tears rose in his eyes as he spoke about how moved he was to be part of such a great church and to work alongside such remarkably committed and inspiring people. He wished he had worked harder to get some congregational members to the event and proceeded to initiate conversation with the others present from our synod about strategies for “getting this great story told in the congregations across the mission territory.” Huddled together as a microcosm of our synod in that little room in a church basement, it felt like a mini-Pentecost had descended. I could see glimmers of fire in this pastor’s teary eyes, reflected in the eyes of his sisters and brothers around the table. After she spoke, Bishop Eaton and the four other bishops present sat down in front of those in attendance for a 45-minute question and answer session. An independent article on that session can be found here. Overall, I came away inspired. Despite the many days away, the drive home was reflectively cheerful. My hope was renewed that at some point all churches will learn to look outside of their four walls and seek to learn from one another. It’s a matter of either striving and flourishing together or withering alone. The task won’t be easy, but we forge ahead, buoyed by the strength of the one who loves and upholds us, our Lord and Savior, Jesus Christ.